It is commonplace to hear people say they do not accept evolution because they don’t see how some of the changes could have taken place. It’s just too complicated they say. What use is half a wing, they ask. As it turns out, the usefulness of half a wing, even a featherless baby wing, has been demonstrated, so that argument is out. Another transition people have difficulty with is the transition from water to land. Regardless of the fact that we have a good bit of fossil evidence demonstrating the transition, many people think that fins and feet are so radically different that they don’t see how it could have happened. Recent research has demonstrated in several ways that this transition is not nearly as hard as people might think, which may explain why it has happened multiple times in the history of life. For a truly bizarre history, one can look at the evolution of the elephants. Before they were elephants, they went from water to land back to the water, then back to the land. So what tells us it really isn’t that hard? Let me introduce you to the robot salamander. This robot and its predecessors were designed to test different models of neural circuits involved in locomotion. What they found is that the same movements of the limb and torso allowed both swimming and walking. The only difference was the amount of resistance placed on the feet. Obviously, the ground supplied much more resistance to the limb motion than did the water. This caused a change in the neural signal, causing it to slow down and become stronger to account for the change in muscle power needed and the reduced speed of the movement. It was the same signal from the brain, it activated the same motor pathways. In other words, fish already had the neural pathways to be good salamanders. Still, there are all the changes needed in the musculature and bones that surely had to be problematic. Research that has only recently been published indicates this isn’t hard either. Bichirs are a type of fish that regularly flops about on land and has true lungs. Emily Standen wanted to see what would happen if a bichir was raised on land and not free-swimming in the water. What they found was that the bichir changed how they crawled about, adopting a pattern that was more efficient. They held their heads higher off the ground and brought their fins closer to the body. More than simple behavioral changes, their skeletons changed as well. The supporting their pectoral fins changed subtly in ways that bore similarities with fossil of the earliest “fishapods”. It should also be noted that these experiments were on juvenile bichirs who were less than 70 days old and only lasted for eight months. This is not a lot of time to see differences. I want to be clear that the bichir experiments do not show evolution of the fish. Evolution does not occur within a single individual. What we see here are epigenetic changes, not involving changes in the DNA. Epigenetic changes demonstrate developmental plasticity, the range over which a species can adapt to new environments without needing genetic alterations. But we now know that epigenetic changes can be passed on to the next generation in processes that are still only dimly understood. Unless these changes become incorporated into the DNA, they will fade if taken out of the environment that is producing the selection for that change. But eventually, these sorts of epigenetic changes can lead to real DNA changes that will lock in the change for all further descendants. In other words, what these experiments demonstrate is that fish already had the necessary developmental plasticity to evolve adaptations to land. As I stated, these sorts of changes have to be incorporated into the DNA, but surely that requires a lot of changes? There have to be a lot of genes that have to be changed radically, right? Turns out, no. The switch is rather simple and it doesn’t even involve changes to protein-producing genes. All it takes is a change in the regulation of those genes. Change the developmental timing, change the amount of a protein here or there, and you turn a fin into a limb. Fish and terrestrial animals use exactly the same genes to make fins and limbs. They just change how they use them. This is why you occasionally get people born with webbed hands and feet. It can even cause polydactyly, having more than the normal number of fingers or toes. Left column shows the control animals showing normal fins. The right column shows the bichir raised on land. Standen et al. 2014. A study published in 2012 looked at the regulation of hox genes, the genes involved in controlling the shape of our bodies, how our limbs are made, how many fingers we have, that sort of thing. All animals have them, they just vary in how many and how they are used. 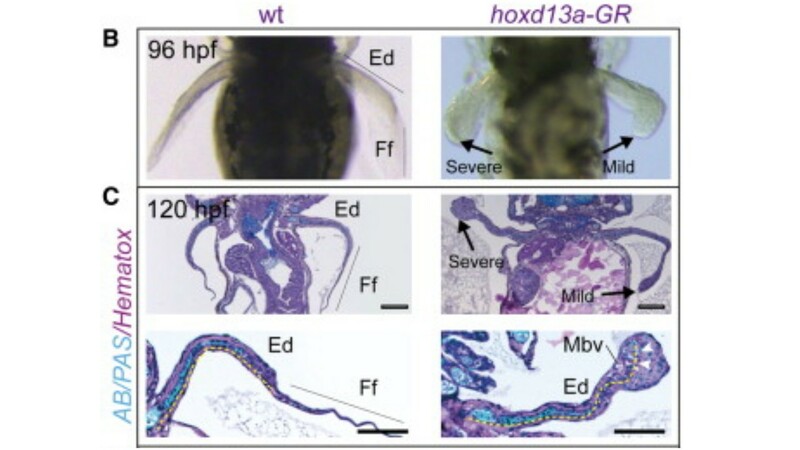 Renata Freitas and her associates took the control sequence for Hoxd13 from a mouse and put it into a zebrafish. The only thing this did was cause the Hoxd13 gene to be overexpressed. This caused the fish to have reduced fin tissue and the growth of cartilage forming what can best be described as a rudimentary limb. Just for emphasis, let’s say that again, simply changing the amount of protein created from this one gene turned a fin into a rudimentary limb. 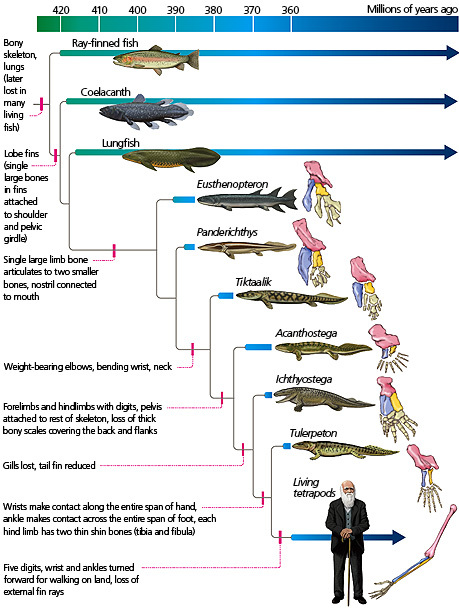 In other words, fish already had all the genes needed to make limbs for terrestrial locomotion. So, we’ve seen that we have a lot of fossils documenting the shift from water to land. We’ve seen that fish already had the needed neural wiring to walk, the developmental plasticity to get started, and all the genes necessary. You can even see the transition showing up in the nerves that supply the human arm called the brachial plexus, the bane of medical students everywhere, which seems bizarre and nonsensical, until one looks at it from an evolutionary perspective. Then it all makes sense. But that is a topic for another day. All the transition really took was a prolonged stimulus that provided a selective advantage for walking around and limbs developed naturally from what was already pre-existing and working fine in the environment in which they evolved. Amazing how much change can be accomplished simply by a change in venue and a little push in the right direction. By paleoaerie in Myths and misconceptions, Paleontology, Uncategorized on September 4, 2014 .